As far as I know, training the same muscles every-day (or in consecutive days) is not a good idea. The muscles can't rest long enough to regenerate and you are "over-training". Is there enough rest in this routine ? Knowing that this routine is for "bodybuilding". Since some answers are not really answering my question, it seems my question is not really clear. So, the main question is this one : is training to failure (in 8-12 reps) the same muscles every other day (and with two days of rest per week) over-training ? It is indeed, possible to train a body part each day. The difference in required rest is the intensity that you train. If a body part is trained resistance that causes failure within an arbitrary min-max of 6 - 15 reps, that body part will not have sufficient rest in less than 24 hours due to the effect on the nervous system, for one. However, If the intensity is dialled back enough, it is possible to train every day and experience a cumulative effect over time of increased strength and muscle size. Another important question is whether your goal is for an increase in strength or size. Given someone who wants to train effectively every day, for strength, the intensity should be around 80%. For size, the intensity should be around 70% to allow more sets to be completed in a workout. 2 consecutive days of resting will surely be enough but since you work at least 2 or more muscles in a day, I suggest you to focus on your nutrition very well in order not to feel exhausted all the time. The premise is wrong, there is not any evidence that muscles need rest days between training days, it's just a gym myth invented by bodybuilders. You can train a muscle 7 days a week 365 days a year without any negative consequences. It's all a matter of volume. Beginners need minimum 10 hard sets per muscle therefore it's easier to divide it in 2 days and do 5 sets each time than dividing it in 7 days. Advanced athletes need a minimum of 15 ** hard** per week and they no actual limit... theoretically a pro athlete could do 48 sets each week and still benefit. So it's easier to do 6-7 sets each day than doing 24 sets two times a week. In the end the effectiveness of your routine depends on the number of sets and effort you put in not on how you split your training days. No, not at all but it might be under-training. We as humans are build for endurance and high work loads as we are probably the top when it comes to endurance out of all land animals. Also because as it is seems the more you train the more muscle you build in a direct dose relationship. 10 sets build 2 times more muscle than 5 sets for example. From the Norwegian Frequency project comparing training 3 times vs 6 times a week. Seems like Frequency plays a strong role too even though Volume has more impact. As you can see, the effect sizes favored the 6x group for the bench press and the deadlift but interestingly not the squat. The differences are small, however. 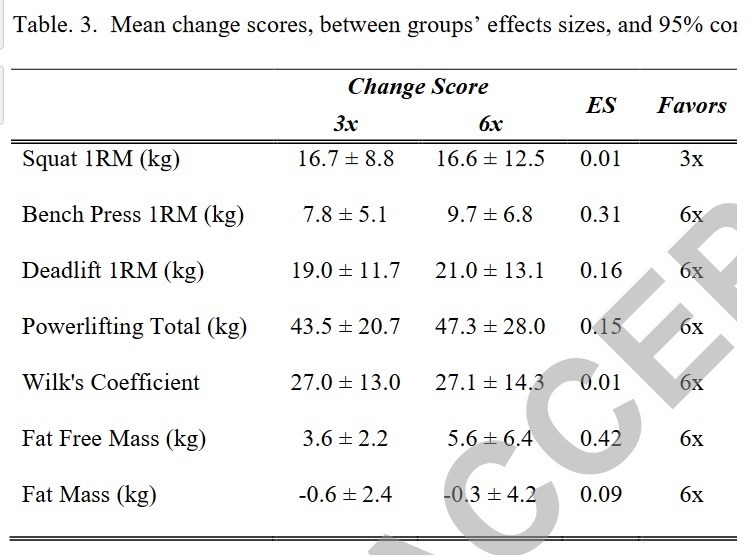 The only effect size difference that really stands out is that for fat-free mass, considerably favoring the 6x group. This suggests better muscle growth in the group training each muscle 6x per week. Training is dose dependent, the more the BETTER. No actual limit seems to exist and if it does no one has found it. Not the answer you're looking for? Browse other questions tagged bodybuilding rest or ask your own question. Why many get stronger by working out with less intensity but every day, with no rest days? Is working out with DOMS everyday bad?